This is quite an old recipe. It comes from the magazine “As” from the year 1937. I like to imagine that my grandma was baking cookies from this recipe. I can’t ask her, but I know she would like them. I found the recipe in Agnieszka’s Maciąg’s book “Smak życia” (“The Taste of Life”). The book was one of many wonderful surprises. I bought it in a bargain bookstore. I wasn’t really convinced, but its layout was nice. Agnieszka is a model and journalist and I’m really suspicious when it comes to stars’ cookbooks, especially ones written by slim, beautiful women. It’s hard to believe they actually like to eat. But luckily the book turned out charming. Simple recipes with interesting introductions and beautiful photos. I use many recipes out of this book, but I must admit that the cookie recipe is my favourite. I took these cookies for the Irish food photography workshop. In a medium bowl whisk together the sugar and flour. Add the butter and sour cream. Knead the dough quickly. Roll it to 1-cm thickness. Cut the cookies with a cutter or glass and place them on a baking sheet. Using a pastry brush, brush the cookies with the egg white. Sprinkle the cookies with the sugar and almonds. 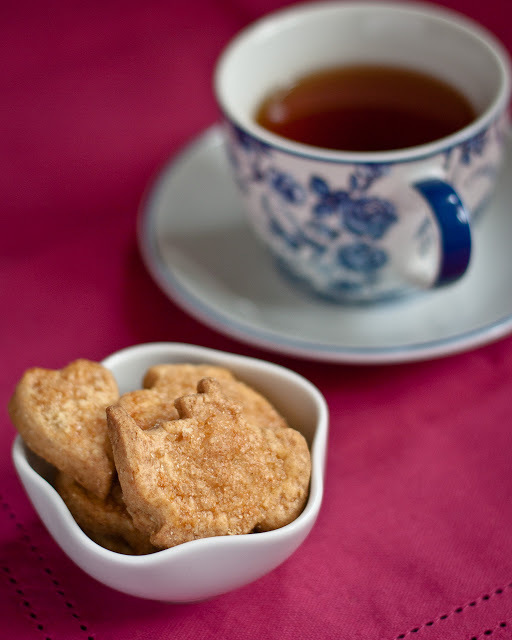 Nice looking cookies Magda, like the almond sugar sprinkling mix. Oh yum! These sound perfect! I love the look of those cookies! And I know what you mean when it comes to cookbooks that are written by skinny models… Always very suspicious!